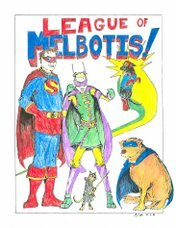 League of Melbotis: Die. Die. Die. Funny movie, hilarious song! I'd pay big money. I'm talking Elvis in Hawii money to see Dracula acted out as a musical with puppets. This was perhaps the only funny part of this movie. I thought it was okay, but I'm not buying it on DVD. It was also the first time I realized Mila Kunis is now a grown up and no longer in the twilight zone of 20-somethings playing teen-agers. On our digital cable we have all the Music Choice channels, including one called "Sounds of the Season". On Halloween, they kept playing this song. Denby here: I loved this movie way more than i expected. Also, Mikey sings the van helsing part of this song to me all the time. Confession time, I love Kristen Bell. I will watch anything with her in it. Check out the directors cut of Fanboys as it is a worthy geek movie.